As we say goodbye to 2015, it is our custom to share the wonderful things the team behind the DirTeam.com / ActiveDir.org Weblogs have achieved. As we changed our underlying platform in December 2014, this year was our first full year on the platform and its accompanying analytics features. Throughout 2015, the DirTeam.com / ActiveDir.org Weblogs served almost 4 million pages. To be exact: we saw 3,988,675 pageviews. Our webserver saw hours where it saw 360 visitors per hour. this means, on average, it served a new visitor every 10 seconds. Most of the time, the webserver would be busiest between 15:00 and 16:00 (GMT), making for an interesting mix between visitors from Europe ending their workdays and people in the US, beginning their workdays. One of the more interesting discussions on websites and their visitors is the browsers used by their visitors and the optimizations made by webmasters to accommodate the mix of browsers used. While most of the pages are optimized to be viewed with mobile devices, only a small percentage of our readers accesses the information we provide on them. 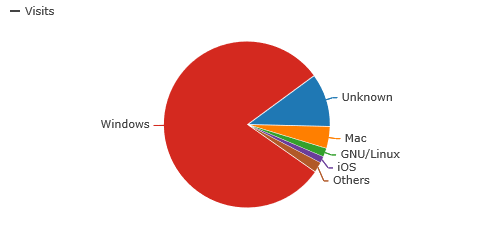 When we look at the browser engines used, we see a similar, but not as clear divide. 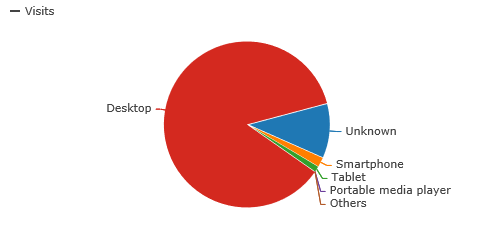 36% of al visits are performed using the Trident agent, corresponding to Microsoft Internet Explorer and Microsoft Edge. 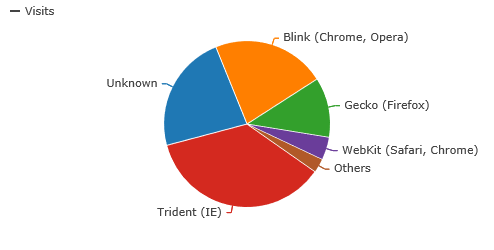 22% of all visits are Blink-based, whereas Gecko picks up 12%.